I bet you didn’t think it could get any better than the brown sugar and buttery taste on the top of a pineapple upside down cake. Just wait until you taste the incredibly moist the cake portion you’ll get with this recipe. By adding crushed pineapple in its juice not only adds an extra moistness to the cake, but it also ups the pineapple flavor. Preheat the oven to 350 degrees F. Melt 3 tablespoons in 2-round cake pans or all 6 tablespoons of butter in a 9 x 13 pan in the oven. Remove the pan(s) from the oven and sprinkle the bottom(s) with the brown sugar. Use a spoon to evenly spread it. Decoratively arrange the pineapple slices on top of the brown sugar. Fill in the spaces with the maraschino cherries. In a bowl, break the eggs. Add the coconut oil and crushed pineapple. Stir them together. Pour the cake mix on top of the wet ingredients. Mix for at least 2 minutes. Don’t worry if the crushed pineapple becomes even finer. Carefully, pour the batter in the prepared pan(s). Bake the cake(s) for about 40 minutes or until done. Remove them from the oven. Very carefully invert the cake(s) onto a serving platter or plate. 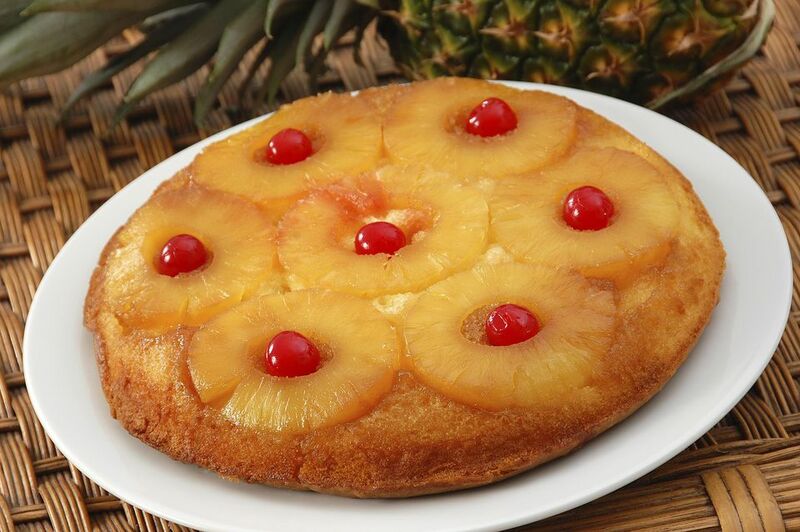 Serve your Double Pineapple Upside-Down Cake warm or room temperature topped with whipped cream. Depending on how many people I serve at a time is how I decide which pans to use to bake this cake. It’s a big help to have one cake to eat and the other to put in the freezer for later. It’s amazing this this odd set of ingredients can taste so good. There’s just something about that sharp cheddar cheese and pineapple combination. This recipe is made with just two, yes two, ingredients. Surprisingly, it tastes pretty good too. You can eat it plain or frosted. Are you looking for a light, yet tasty cookie? Try these drop cookies. They are a sturdy cookie with a delicate flavor. This Punch Bowl Cake recipe has two versions. One version is made with a cake mix and instant puddings. The other version shows how to make if from scratch. F.Y.I. in case you didn’t know another name for a Punch Bowl Cake is a trifle. You’ve got the best of the tropics in this one little cake. There’s pineapple, coconut and lots of nuts in this rich cake.